Sport Lisboa e Benfica ComC MHIH OM (Portuguese pronunciation: [spɔɾ liʒˈboɐ i bɐ̃ȷ̃ˈfikɐ]), commonly known as Benfica, is a sports club based in Lisbon, Portugal. It is best known for the professional football team playing in the Primeira Liga, the top flight of the Portuguese football league system, where they are the most successful club in terms of titles won. Founded on 28 February 1904 as Sport Lisboa, Benfica is one of the "Big Three" clubs in Portugal that have never been relegated from the Primeira Liga, along with rivals Sporting CP and FC Porto. The Benfica team is nicknamed Águias (Eagles), for the symbol atop the club's crest, and Encarnados (Reds), for the shirt colour. Since 2003, their home ground has been the Estádio da Luz, which replaced the larger, original one, built in 1954. Benfica is the most supported Portuguese club, with an estimated 14 million supporters worldwide, and the European club with the highest percentage of supporters in its own country, reportedly having 206,437 members. The club's anthem, "Ser Benfiquista", refers to its supporters, who are called benfiquistas. Águia Vitória is their mascot. Benfica is honoured with three Portuguese Orders: those of Christ (Commander), of Prince Henry (Honorary Member) and of Merit (Officer). With a total of 81 major trophies won – 82 including the Latin Cup – Benfica is the most decorated club in Portugal. They have won 79 domestic trophies: a record 36 Primeira Liga titles, a record 26 Taça de Portugal, a record 7 Taça da Liga, 7 Supertaça Cândido de Oliveira and 3 Campeonato de Portugal. Internationally, they won back-to-back European Cups in 1961 and 1962 – a unique feat in Portuguese football – and were runners-up at the Intercontinental Cup in 1961 and '62, at the European Cup in 1963, '65, '68, '88 and '90, and at the UEFA Cup/Europa League in 1983, 2013 and '14. Benfica's ten European finals are a domestic record and ranked seventh all-time among UEFA clubs in 2014. Moreover, Benfica hold the European record for the most consecutive wins in domestic league and the record for the longest unbeaten run in Primeira Liga, where they became the first undefeated champions, in 1972–73. Benfica was ranked twelfth in FIFA Club of the Century and ninth in IFFHS Top 200 European clubs of the 20th century. Currently, Benfica is ranked 21st in the UEFA club coefficient rankings and has the second most participations in the European Cup/UEFA Champions League (38). In this tournament, they hold the overall record for the biggest aggregate win, achieved in 1965–66. On 28 February 1904, members of Associação do Bem (a group of former students from the Real Casa Pia de Lisboa) met at the back of Farmácia Franco on Rua de Belém with the goal of forming a social and cultural football club called Sport Lisboa, composed of Portuguese players only. 24 people attended the meeting, including Cosme Damião, who would be the club's most important leader in the first decades. In that meeting, José Rosa Rodrigues was appointed club president, along with Daniel Brito as secretary and Manuel Gourlade as treasurer. The founders decided that the club's colours would be red and white and that the crest would be composed of an eagle, the motto "E pluribus unum" and a football. Sport Lisboa played their first match ever on 1 January 1905, scoring their first goal. Despite important victories, the club suffered from poor operating conditions, namely the football dirt field Terras do Desembargador. As a result, eight players moved to Sporting CP in 1907 and started the rivalry between the clubs. 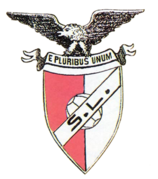 On 13 September 1908, Sport Lisboa acquired Grupo Sport Benfica by mutual agreement and changed its name to Sport Lisboa e Benfica. Despite the club merger, they continued their respective club operations. For Sport Lisboa, they maintained the football team, the shirt colours, the eagle symbol and the motto. For Grupo Sport Benfica, they maintained the field Campo da Feiteira, the main directors and the club's house. Both clubs determined that the foundation date should coincide with Sport Lisboa's because it was the most recognised club and quite popular in Lisbon due to its football merits. In regard to the crest, a cycling wheel was added to Sport Lisboa's to represent the most important sport of Grupo Sport Benfica. Furthermore, the two entities of the "new" club had simultaneous members who helped stabilise operations, which later increased the success of the merger. However, problems with the club's rented field (Campo da Feiteira) remained. Benfica moved to their first football grass field, Campo de Sete Rios, in 1913. Four years later, after refusing an increase in rent, they relocated to Campo de Benfica. Finally, in 1925, they moved to their own stadium, the Estádio das Amoreiras, playing there fifteen years before moving to the Estádio do Campo Grande in 1940. The Portuguese league began in 1934, and after finishing third in its first edition, Benfica won the next three championships in a row (1935–36, '36–37, '37–38) – the club's first tri, achieved by Lippo Hertzka. Throughout the 1940s, Benfica would win three more Primeira Liga (1941–42, '42–43, '44–45) and four Taça de Portugal (1940, '43, '44, '49), with coach János Biri achieving the first double for the club in 1943. Benfica's first international success happened in 1950 when they won the Latin Cup (the only Portuguese club to do so), defeating Bordeaux with a golden goal from Julinho at the Estádio Nacional in Lisbon, with Ted Smith as coach. It was the first major international trophy won by a Portuguese club. They reached another final of the competition in 1957 but lost to Real Madrid at the Santiago Bernabéu. With the election of president Joaquim Ferreira Bogalho in 1952 and the arrival of coach Otto Glória in 1954, Benfica became more modernised and professional and moved into the original Estádio da Luz, with an initial seating capacity of 40,000; expanded to 70,000 in 1960. During the 1950s, Benfica won three Primeira Liga (1949–50, '54–55, '56–57)[note 1] and six Taça de Portugal (1951, '52, '53, '55, '57, '59). Led by coach Béla Guttmann, Benfica were one of two teams, along with Barcelona, to break Real Madrid's dominance in the European Cup by winning two consecutive trophies: the first one against Barcelona in 1961 (3–2) and the second one against Real Madrid in 1962 (5–3). Later on, Benfica reached another three European Cup finals but lost them to Milan in 1963, to Inter in 1965, and to Manchester United in 1968. The 1960s were Benfica's best period, in which they won eight Primeira Liga (1959–60, '60–61, '62–63, '63–64, '64–65, '66–67, '67–68, '68–69), three Taça de Portugal (1962, '64, '69) and two European Cups (1960–61, '61–62). Many of their successes in that decade were achieved with Eusébio – the only player to win the Ballon d'Or for a Portuguese club – Coluna, José Águas, José Augusto, Simões, Torres, and others, who formed the 1963–64 team that set a club record of 103 goals in 26 league matches. Benfica were ranked first in European football in 1965, '66 and '69. Moreover, they were presented with the France Football European Team of the Year award in 1968. During the 1970s, with president Borges Coutinho, Benfica faded slightly from the European scene but remained the main force in Portuguese football, as they won six Primeira Liga titles (1970–71, '71–72, '72–73, '74–75, '75–76, '76–77) and two Taça de Portugal (1970, '72). In 1971–72, Benfica attracted Europe-wide attention once again when they reached the semi-finals of the European Cup, where they were eliminated by Ajax of Johan Cruyff. Led by Jimmy Hagan the following season, Benfica became the first club in Portugal to win the league without defeat, winning 28 matches – 23 consecutively – out of 30, and drawing 2. They scored 101 goals, and Eusébio was later crowned Europe's top scorer, again, this time with 40 goals. This decade was also marked by the fact that Benfica started to admit foreign players in the team, becoming the last Portuguese club to do so, in 1979. In the 1980s, Benfica continued to thrive domestically. With Lajos Baróti in 1980–81, Benfica became the first club to win all Portuguese trophies in one season: Supertaça de Portugal, Primeira Liga and Taça de Portugal. Later, under the guidance of Sven-Göran Eriksson, they won two consecutive Primeira Liga (1982–83, '83–84), one Taça de Portugal (1983) and reached the final of the UEFA Cup in 1983, lost to Anderlecht. Following improvements to the Estádio da Luz, Benfica opened the stadium's third tier in 1985, transforming it into the largest stadium in Europe and third largest in the world. A season later, after they had won the domestic cup in 1986, Benfica clinched the double of Primeira Liga and Taça de Portugal. Then, from 1988 to 1994, Benfica made a significant investment in order to win another European Cup, reaching two European Cup finals in 1988 and '90, won by PSV Eindhoven and Milan, respectively. Moreover, during the same period, Benfica won three Primeira Liga (1988–89, '90–91, '93–94) and one Taça de Portugal (1993). Financial trouble in the early 1980s and a large investment on players throughout that decade started to deteriorate the club's finances under Jorge de Brito's presidency. The rampant spending and a questionable signing policy (over 100 players during Manuel Damásio's term) further aggravated the problem. Soon after, Benfica entered in default during João Vale e Azevedo's presidency. In 2001, with president Manuel Vilarinho, club members approved the construction of the new Estádio da Luz, which would eventually cost €162 million. The period from 1994 to 2003 was arguably the most difficult in the club's history. During that time, Benfica had a total of eleven managers, won a single Taça de Portugal, suffered their biggest defeat in European competitions, 7–0 to Celta de Vigo, had their lowest league finish ever, a sixth place, and were absent from European competition for two years. In the 2003–04 season, with president Luís Filipe Vieira, Benfica put an end to their silverware drought by winning the Taça de Portugal against José Mourinho's Porto. They dedicated the trophy to Miklós Fehér, who had died in January 2004. The following year, Benfica won the league title, eleven years after the previous one, and the Supertaça Cândido de Oliveira. After that and until 2009, when Benfica won its first Taça da Liga (thus becoming the first club to win all major domestic competitions), they did not win any trophies and finished fourth in the 2007–08 league. In Europe, Benfica had three consecutive appearances in the group stage of the UEFA Champions League, with their best result being a quarter-final stage in 2005–06, after beating Manchester United in the decisive group stage encounter and overcoming then European champions Liverpool on 3–0 aggregate. For the 2009–10 season, Jorge Jesus was appointed manager, a position he held until 2015. During that six-season span, Benfica won 10 domestic trophies, including an unprecedented treble in Portuguese football (league, cup and league cup) in 2014, as well as the club's first back-to-back league titles since 1984. At European level, Benfica moved from 23rd to 6th place in UEFA's team ranking as a result of their performance in international competition: they reached their first European semi-final in seventeen years at the 2010–11 Europa League, repeated the 2005–06 Champions League quarter-finals in the 2011–12 campaign and were runners-up in Europa League for two consecutive seasons (2012–13 and '13–14). Later on, with manager Rui Vitória, whose spell lasted three and a half seasons, Benfica won a fourth Primeira Liga title in a row – their first tetra ever – one Taça de Portugal, one Taça da Liga and two successive Super Cup trophies; the latter in 2017 after they reachieved a 36-year-old treble. Internationally, a year after they had consecutively reached the Champions League knockout phase for the first time in their history, Benfica suffered their biggest loss in the competition, 5–0 to Basel, and went on setting the worst Portuguese group stage campaign. Benfica's crest is composed of an eagle (as a symbol of independence, authority and nobility), positioned atop the shield with the colours red and white (symbolising bravery and peace, respectively); the motto "E pluribus unum" ("Out of many, one" – defining union between all members); and the club's initials ("SLB") over a football; everything superimposed on a bicycle wheel (representing one of the first sports in the club, cycling). The club has had four main crests since its inception in 1904. 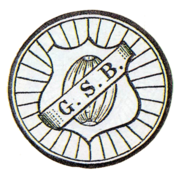 The origin of the current crest goes back to 1908 when Sport Lisboa merged with Grupo Sport Benfica. Back then, only red and white colours were displayed on the crest. In 1930, the crest was altered and the colours from the flag of Portugal were added. Sixty-nine years later, in 1999, the crest was changed again. The most significant changes were the modification and repositioning of the eagle and the reduction of the size of the wheel. Benfica have used commemorative crests since 2010 by adding stars over the crest. They started by adding one star in celebration of their first European Cup, and in 2011 they added two stars to commemorate their second one. A year later, they started using three stars, with each star representing 10 league titles won by the club. José da Cruz Viegas was the man responsible for the selection of Benfica's kit in 1904. Red and white colours were chosen for being the ones that stood out better to players' eyes. One year after its foundation, the club opted for red shirts with white collars, openings and cuffs, combined with white shorts and black socks. Benfica's white alternative kit was officially used for the first time in 1944–45 when Salgueiros, who also wore red, were promoted to the first division. Benfica have always worn red shirts. For this reason, in Portugal, Benfica and its supporters (benfiquistas) were nicknamed vermelhos ("reds"). This changed in 1936 with the start of the Spanish Civil War: the Portuguese Estado Novo's Censorship Commission censored the word "vermelhos" because the Popular Front communists in Spain were also known as vermelhos. From then on, Benfica became known as encarnados (similar to "reds" but with a different connotation). During the club's first decades, Benfica played mostly in rented grounds. Their first own stadium was the Estádio das Amoreiras, built and opened in 1925. There they played until 1940. A year later, they moved to the Estádio do Campo Grande, a rented municipal stadium, before relocating to their own second ground thirteen years later. Like its predecessor, the Estádio da Luz is officially named Estádio do Sport Lisboa e Benfica. A UEFA category four stadium, it hosted several matches of the UEFA Euro 2004, including the final, and was the venue for the 2014 UEFA Champions League Final. Built with a full seating capacity of 65,647, the stadium currently has 64,642 seats. The supporters of Benfica are known as benfiquistas. They sing the club's anthem at the start of every home match and sometimes during the match. 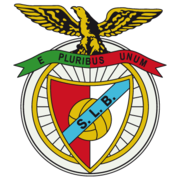 They call the club o Glorioso (the Glorious One), hence the popular chant "Glorioso SLB". In some countries, since 1952, Benfica has had supporters' clubs known as Casas do Benfica (Benfica Houses), which are places where benfiquistas gather. 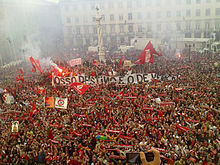 In recent years, benfiquistas have celebrated league titles with the team at the Marquis of Pombal Square in Lisbon. Benfica is the most popular club in Portugal and has always been seen as the working-class club of Portugal. According to a study done by professors Luís Reto and Jorge de Sá, with the stamp of approval by Instituto Nacional de Estatística (INE) and Secretaria de Estado das Comunidades, Benfica has approximately 14 million supporters worldwide: over 5.5 million in Europe (4.7 in Portugal); over 6 million in Mozambique (3.8) and Angola (2.7); over 1 million in the United States and Canada; and the rest being located in Brazil, Venezuela, Caribbean, Indochina, China, Australia and India. According to a study performed for UEFA in 2012, Benfica is the European club with the highest share of football supporters in its own country (47%). In the 2016–17 season, Benfica had an average home attendance of 55,952 in the Portuguese league, the current record at the Estádio da Luz. It was the highest average of the competition and 9th highest among other European clubs. The highest home attendance record was also broken – 64,519 spectators saw Benfica's 5–0 win over Vitória de Guimarães in the season's last match at Da Luz. The members of Benfica, who are called sócios, democratically elect the club president for a four-year term (three years until 2010) by voting in each candidate list, forming the highest governing body of the club. They also participate in general assemblies, submit proposals, take part in discussions, and so forth. They can be elected to governing bodies, to be designated for positions or functions at the club, etc. In 2003 the club switched to electronic voting, and since 2010 only members with 25 years of uninterrupted filiation as an adult (43 years of age) can candidate to the presidency of Benfica. On 9 November 2006, Benfica set the Guinness World Record for "the most widely supported football club", with 160,398 paid-up members. In 2014, according to a study by Movimento Por Um Futebol Melhor, Benfica had 270,000 members and was the biggest club in the world in membership terms. On 31 March 2015, Benfica reported having 246,401 members; however, after a scheduled renumbering by the club in August that year, the number decreased to 156,916. According to Benfica, they had a total of 206,437 members on 31 December 2017. Benfica has rivalries with Sporting CP and FC Porto, with whom it forms the "Big Three": Portugal's most decorated clubs. None of them have been relegated from the Portuguese league since its establishment in 1934. As Lisbon-based clubs, Benfica and Sporting have shared a rivalry for over a century; it all started in 1907 when eight prominent Benfica players defected to Sporting. Followed in Europe, Africa and the Americas, any match between both teams is known as dérbi de Lisboa ("Lisbon derby"), dérbi eterno ("eternal derby"), dérbi da Segunda Circular, dérbi dos dérbis ("derby of the derbies"). It is the most important football derby in Portugal. The rivalry between Benfica and FC Porto, which started with a friendly match on 28 April 1912, comes about as Lisbon and Porto are the largest Portuguese cities, respectively. Benfica and Porto are currently the two most decorated clubs in Portuguese football, with the former historically being the most decorated team overall. Any match between the two sides is called O Clássico ("The Classic"). In 2008, Benfica launched its own sports-oriented television network, Benfica TV (BTV for short), the first channel by a Portuguese club, and has operated it ever since. Its premium channel broadcasts Benfica's live matches at home in the Primeira Liga, home matches from Benfica B in the LigaPro, from the under-19 team and below, as well as matches from other sports of the club, including youth categories. Until 2016, it broadcast three seasons of the English Premier League, and one season of the Italian Serie A and French Ligue 1. Moreover, the club publishes the weekly newspaper O Benfica every Friday since 28 November 1942. It contains information about everything in the club in the form of news and articles (mostly the former). By 2005, it had a circulation of close to 10,000. Benfica also publishes the quarterly magazine Mística since 6 December 2007. Free of charge for Benfica members, it comprises interviews with players and personnel of the club, reports about the club's history and recent events, news, opinion pieces, overviews of different sports of the club, with football being its main focus, and a section dedicated to club members. Issue 33 had a circulation of 115,602 in mainland Portugal. O Benfica Ilustrado was the club's former magazine; it was launched in September 1957 as an alternative/complement to the news density of O Benfica. Sport Lisboa e Benfica – Futebol, SAD (a public limited company) was created by João Vale e Azevedo on 10 February 2000 with an initial equity of €75 million. There were five major reasons for creating an autonomous entity to manage the Benfica team: participation in professional football competitions at domestic and international level; development of football players; exploitation of TV rights on open and closed channels; management of the players' image rights; exploitation of the Benfica brand by the professional football team and at sporting events. Benfica SAD entered the PSI-20 on 21 May 2007 with an initial stock value of €5 on 15,000,001 shares. Later in June that year, Joe Berardo launched a partial takeover bid for Benfica SAD (60%) for €3.50 a share, which was unsuccessful. Following the general assembly of 23 December 2009, the SAD increased the €75 million equity to €115 million by absorbing Benfica Estádio, SA (then owner of the Estádio da Luz), resulting in balance sheet insolvency. On 31 July 2014, the SAD completed the acquisition of Benfica Stars Fund by spending roughly €28.9 million for 85%, thus purchasing the remaining economic rights of nine players. Later in April, Benfica and Adidas renewed their previous ten-season contract of 2003 until 2021, for around €4.5 million per year. In May 2015, Emirates airline signed a three-year sponsorship deal worth up to €30 million in order to become Benfica's main jersey sponsor. Then in December, Benfica sold their first-team TV rights as well as the distribution and broadcasting rights to NOS in a three-year deal, receiving €40 million per season, with the option to extend the contract to a maximum of ten seasons, totalling €400 million. Days later, Luís Filipe Vieira stated that the money from the latter contract would be used to lower Benfica's debt. In June 2016, Benfica was ranked by Brand Finance as the 47th most valuable football brand, valued at €86 million. By June 2017, Benfica had earned €617 million from player transfers since the 2010–11 season, more than any other club in the world. In September 2018, Benfica SAD reported a profit of €20.6 million (a decrease of 53.7%) and a total revenue of €206.2 million (a decrease of 18.7%). Moreover, they reported a record total equity of €86.8 million: total assets of €485.1 million (a decrease of 4.1%) and total liabilities of €398.3 million (a decrease of €40.1 million). It was the first time since 2010–11 that the debt was below €400 million. In January 2019, Benfica remained the only Portuguese club to ever appear in the Deloitte Football Money League, being ranked as the world's thirtieth highest commercial revenue generating football club in 2017–18, with a revenue of €150.7 million. On 27 January 2004, Benfica retired the squad number 29 in memory of Miklós Fehér, who had died while playing for them two days earlier. Nené is the Benfica player with most official appearances (575). Eusébio is the club's all-time top goalscorer, with 473 goals in 440 competitive matches. He is also Benfica's top scorer in UEFA club competitions, with 56 goals. Luisão is the player with most trophies won (20), the captain with most matches and has the most appearances in European matches. Cosme Damião is the longest-serving coach (18 consecutive years). Otto Glória is the coach with the most league titles won (4). Jorge Jesus is the coach with most trophies won (10: 3 leagues, 1 cup, 5 league cups, 1 super cup). Rui Vitória is the coach with the highest percentage of wins in the domestic league with a minimum 34 matches played (85.29%). Benfica became the first team in Portuguese league history to complete two seasons without defeat, namely the 1972–73 and 1977–78 seasons. In the former, as unbeaten champions, they achieved two records: 58 points in 30 matches, the most ever obtained (96.7% efficiency), and the largest difference of points ever between champions and runners-up (18 points) in a two-points-per-win system. In the 2015–16 campaign, Benfica amassed 88 points in 34 matches and set the points record since the league is contested by 18 teams. Benfica's record of lowest number of goals conceded in the Primeira Liga was achieved in 1988–89 with manager Toni: 15 goals in 38 matches. Furthermore, Benfica hold the European record for the most consecutive wins in domestic league (29), between 1971–72 and 1972–73, as well as the domestic record for the longest unbeaten run in the league (56 matches), from 24 October 1976 to 1 September 1978. In addition, Benfica hold Europe's longest unbeaten run in all competitions since the advent of European competition: 48 matches from December 1963 to 14 February 1965. A record that ranks third overall. 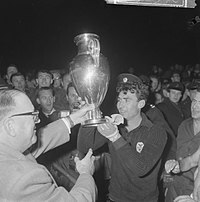 In the 1965–66 European Cup, Benfica scored 18 goals against Stade Dudelange and achieved the highest goal margin on aggregate in European Cup and their biggest win in UEFA competitions. In the UEFA Europa League, Benfica was the first club to reach two finals consecutively, the latter without defeat. As of the 2017–18 season, Benfica have 37 appearances in the European Cup/UEFA Champions League and 19 appearances in the UEFA Cup/Europa League. Additionally, they have appearances in now-defunct competitions: 7 in UEFA Cup Winners' Cup and 2 in the Intercontinental Cup. In 2014, Benfica achieved the first ever treble of Primeira Liga, Taça de Portugal and Taça da Liga. As of the 2017–18 season, Benfica is the only club to have won the Primeira Liga and Taça da Liga double, moreover, four times. Benfica is also the only club in Portugal to have successfully defended every major domestic title (Campeonato de Portugal, Primeira Liga, Taça de Portugal, Supertaça Cândido de Oliveira and Taça da Liga). In addition, Benfica are the only Portuguese team to have become back-to-back European champions. ^ Benfica were Portuguese champions in 1955 but were not invited to the inaugural European Cup by its organisers. ^ The Latin Cup, a forerunner of the European Cup, is excluded from the trophy count by FIFA, although the latter's website did include it. ^ a b "Tipologia de lugares" [Seating typology] (PDF). CMVM (in Portuguese). S.L. Benfica. 14 April 2016. p. 81. ^ a b Viegas, João Socorro (20 May 2016). "Benfica reforça estatuto de clube mais titulado em Portugal" [Benfica reinforce status of most decorated club in Portugal]. Record (in Portuguese). Retrieved 23 May 2016. ^ a b "Benfica soma 80.º troféu da sua história, mais a Taça Latina" [Benfica add up 80th trophy in their history, plus the Latin Cup]. SAPO Desporto (in Portuguese). 28 May 2017. Retrieved 31 May 2017. ^ "Águias reforçam sétimo lugar do "ranking" de finais europeias" [Eagles reinforce seventh place in European finals ranking]. Record (in Portuguese). 1 May 2014. Retrieved 27 January 2016. ^ "Europe's Club of the Century". IFFHS. 10 September 2009. Archived from the original on 5 November 2013. Retrieved 28 May 2014. ^ "Member associations – UEFA rankings – Club coefficients". UEFA. Retrieved 20 April 2019. ^ "2018–19 UEFA Champions League statistics handbook – All-time records 1955–2018" (PDF). UEFA. p. 1. ^ a b c Pereira 2009, p. 143. ^ "Foundation". S.L. Benfica. 16 May 2017. Retrieved 7 September 2017. ^ a b c "Statutes" (PDF). S.L. Benfica. Archived from the original (PDF) on 3 July 2015. ^ a b c d e f Silveira, João (30 August 2011). "História Benfica" [Benfica History]. zerozero (in Portuguese). Retrieved 7 September 2017. ^ Pereira 2009, p. 45. ^ a b c d e "History of the Stadiums". S.L. Benfica. Retrieved 5 December 2014. ^ Pereira 2009, p. 55. ^ Pereira 2009, p. 118. ^ Pereira 2009, p. 139. ^ Pereira 2009, p. 180. ^ "Bicampeões para a história" [Back-to-back champions for the ages]. Visão (in Portuguese). Portugal: Impresa Publishing. May 2015. p. 42. ISSN 0872-3540. ^ a b Stokkermans, Karel; Gorgazzi, Osvaldo José (23 November 2006). "Latin Cup". RSSSF. Retrieved 2 July 2015. ^ a b c d "Os 57 treinadores do Benfica" [Benfica's 57 coaches]. Diário de Notícias (in Portuguese). 26 August 2008. Retrieved 22 May 2015. ^ Pereira 2009, p. 165. ^ a b "Benfica soma 77 troféus e deixa FC Porto a três e Sporting a 30" [Benfica count 77 trophies and leave FC Porto at three and Sporting at 30]. SAPO Desporto (in Portuguese). 20 May 2016. Retrieved 23 May 2016. ^ Pereira 2009, p. 120. ^ "Estádio do Sport Lisboa e Benfica (1954)". S.L. Benfica (in Portuguese). Archived from the original on 1 May 2014. Retrieved 13 July 2017. ^ a b Silveira, João (24 October 2012). "Estádio da Luz: a Catedral" [Estádio da Luz: the Cathedral]. zerozero (in Portuguese). Retrieved 5 July 2015. ^ "Benfica end Madrid's golden age". UEFA. 1 September 2014. Archived from the original on 19 May 2015. Retrieved 19 May 2015. ^ "Eusébio stars in Benfica's second triumph". UEFA. 1 September 2014. Archived from the original on 19 May 2015. Retrieved 19 May 2015. ^ Gonçalves, Pedro (15 June 2015). "The greatest teams of all time: Benfica 1960-62". UEFA. Retrieved 23 March 2018. ^ Real Madrid V Benfica - European Cup Final In Amsterdam (1962). British Pathé. 13 April 2014. Retrieved 15 April 2019 – via YouTube. ^ 1963 European Cup Final - Milan V Benfica (1963). British Pathé. 13 April 2014. Retrieved 15 April 2019 – via YouTube. ^ Pereira 2009, p. 43. ^ "Foi há 50 anos que Eusébio recebeu a Bola de Ouro" [It was 50 years ago that Eusébio received the Golden Ball]. Maisfutebol (in Portuguese). 28 December 2015. Retrieved 29 December 2015. ^ a b c "Glorioso Benfica" [Glorious Benfica]. Record (in Portuguese). Portugal: Edisport. 11 May 2010. p. 66. ^ Kassies, Bert. "UEFA Team Ranking 1965". Retrieved 20 June 2016. ^ Kassies, Bert. "UEFA Team Ranking 1966". Retrieved 20 June 2016. ^ Kassies, Bert. "UEFA Team Ranking 1967". Retrieved 20 June 2016. ^ Pereira 2009, p. 91. ^ a b "Portugal's great divide". FIFA. Archived from the original on 27 January 2013. Retrieved 30 June 2015. ^ a b "Faleceu Fernando Martins" [Fernando Martins has passed away]. O Jogo (in Portuguese). 28 July 2013. Retrieved 5 September 2017. ^ a b Pereira 2009, p. 17. ^ Martins, Nuno (25 January 2012). "Fernando Martins: Dei muito ao clube" [Fernando Martins: I gave a lot to the club]. Record (in Portuguese). Retrieved 5 June 2018. ^ Tavares-Teles, Alexandra (28 May 2011). "De bancário a banqueiro" [From bank clerk to banker]. Diário de Notícias (in Portuguese). Retrieved 5 June 2018. ^ "Jorge Artur Rego de Brito". S.L. Benfica (in Portuguese). Archived from the original on 13 July 2014. Retrieved 20 September 2015. ^ "Manuel Damásio: o presidente que contratou Donizete e falhou Jardel" [Manuel Damásio: the president who hired Donizete and failed Jardel]. Record (in Portuguese). 3 March 2016. Retrieved 10 June 2016. ^ Stafford, Ian (7 December 1998). "Football: Souness must tame monster of Benfica". The Independent. Retrieved 11 February 2016. ^ Dias, Rui (6 November 2000). "Benfica e os jogadores brasileiros da história do clube" [Benfica and the Brazilian players in the club's history]. Record (in Portuguese). Retrieved 11 February 2016. ^ "pt football club, Benfica, faces financial problems". BBC News Online. 1 May 1998. Retrieved 20 September 2015. ^ "Benfica face financial uncertainty". BBC Sport. 25 September 2001. Retrieved 22 May 2015. During Vale e Azevedo's three year presidency the Lisbon club ran up huge debts and at times was unable to pay taxes or players' salaries. ^ Pereira 2009, p. 113. ^ a b "Vender jogadores para gerar receitas" [Selling players to generate revenue]. Record (in Portuguese). 29 April 2015. Retrieved 8 November 2018. ^ a b c d e "SL Benfica". UEFA. 22 September 2014. Retrieved 13 September 2017. ^ Gonçalves, Pedro (25 April 2015). "Snap shot: When Benfica beat Mourinho's Porto". UEFA. Retrieved 8 July 2015. ^ a b "Miklos Fehér partiu há 11 anos" [Miklos Fehér passed away 11 years ago]. S.L. Benfica (in Portuguese). 25 January 2015. Archived from the original on 28 January 2015. Retrieved 25 January 2015. ^ "Benfica clinch first title since 1994". ESPN FC. 23 May 2005. Retrieved 8 July 2015. ^ Célio, Vasco (13 August 2008). "Benfica vence Supertaça frente ao Setúbal" [Benfica win Super Cup over Setúbal]. Público (in Portuguese). Archived from the original on 17 February 2015. Retrieved 8 July 2015. ^ "Benfica 2–1 Man Utd". BBC Sport. 7 December 2005. Retrieved 8 July 2015. ^ "Liverpool 0–2 Benfica (agg 0–3)". BBC Sport. 8 March 2006. Retrieved 8 July 2015. ^ "Sport Lisboa e Benfica – Futebol SAD informa acordo Jorge Jesus" [Sport Lisboa e Benfica – Futebol SAD inform Jorge Jesus agreement] (PDF). CMVM (in Portuguese). S.L. Benfica. 17 June 2009. ^ Gonçalves, Pedro (15 June 2015). "Poderá Rui Vitória levar o Benfica a um novo patamar?" [Can Rui Vitória take Benfica to a new level?]. UEFA (in Portuguese). Retrieved 26 January 2016. ^ "Benfica proud of mammoth Portuguese haul". UEFA. 19 May 2014. Retrieved 20 May 2014. ^ Pimentel, José Nuno (17 May 2015). "Benfica retain Portuguese crown". UEFA. Retrieved 18 May 2015. ^ "Benfica Campeão da Liga NOS 2014–2015 – Liga Portugal" [Benfica Champions of Liga NOS 2014–2015]. Liga Portugal (in Portuguese). 17 May 2015. Archived from the original on 19 May 2015. Retrieved 19 May 2015. ^ a b Kassies, Bert. "UEFA Team Ranking 2009". Retrieved 28 May 2017. ^ a b Kassies, Bert. "UEFA Team Ranking 2015". Retrieved 28 May 2017. ^ Isaura, Almeida (14 April 2011). "Benfica feliz na Europa 17 anos depois" [Benfica happy in Europe 17 years later]. Diário de Notícias (in Portuguese). Retrieved 8 July 2015. ^ McNulty, Phil (4 April 2012). "Chelsea 2–1 Benfica (agg 3–1)". BBC Sport. Retrieved 4 June 2015. ^ McNulty, Phil (15 May 2013). "Benfica 1–2 Chelsea". BBC Sport. Retrieved 11 September 2017. ^ Atkin, John (14 May 2014). "Spot-on Sevilla leave Benfica dreams in tatters". UEFA. Retrieved 25 June 2015. ^ Gardner, Paul (15 May 2014). "Brazen goalkeeper cheating helps Sevilla win Europa League". Soccer America. Retrieved 17 May 2014. ^ Gonçalves, Pedro (13 May 2017). "Benfica make it four in a row in Portugal". UEFA. Retrieved 5 September 2017. ^ a b Myson, Chris (20 May 2016). "Benfica romp to Taça da Liga success". Goal. Retrieved 6 June 2016. ^ "Entrada forte em jogo vale sétima Supertaça ao Benfica" [Strong start in match gives Benfica seventh Super Cup]. Diário de Notícias (in Portuguese). 5 August 2017. Retrieved 7 January 2019. ^ Santiago, Eduardo (29 May 2017). "Análise: E três foi a conta que o Benfica fez" [Analysis: And three was the sum Benfica made]. SAPO Desporto (in Portuguese). Retrieved 5 September 2017. ^ "Benfica soma inédito segundo apuramento para os oitavos" [Benfica achieve unprecedented second qualification for the round of 16]. SAPO Desporto (in Portuguese). 7 December 2016. Retrieved 5 September 2017. ^ Sampaio, Inês Braga; Freitas, Marília (4 January 2019). "Os números que explicam a saída de Rui Vitória do Benfica" [The numbers that explain Rui Vitória's departure from Benfica]. Rádio Renascença (in Portuguese). Retrieved 7 January 2019. ^ Candeias, Pedro (19 May 2015). "30 anos, 11 patrocinadores, 24 títulos. História visual das camisolas do Benfica" [30 years, 11 sponsors, 24 titles. Visual history of Benfica jerseys]. Expresso (in Portuguese). Retrieved 20 May 2015. ^ "Época 1977/1978" [1977–78 season]. SLB Camisolas Originais (in Portuguese). Retrieved 13 September 2017. ^ a b "Época 1989/1990" [1989–90 season]. SLB Camisolas Originais (in Portuguese). Retrieved 13 September 2017. ^ a b "Época 1993/1994" [1993–94 season]. SLB Camisolas Originais (in Portuguese). Retrieved 13 September 2017. ^ a b "Benfica e Adidas renovam acordo até 2021" [Benfica and Adidas renew deal until 2021]. Diário de Notícias (in Portuguese). 19 April 2014. Retrieved 13 September 2017. ^ "Symbols". S.L. Benfica. Retrieved 7 July 2015. ^ "Benfica não vai alterar emblema" [Benfica will not change crest]. S.L. Benfica (in Portuguese). 17 December 2007. Archived from the original on 27 April 2010. Retrieved 2 September 2011. ^ "Equipamento alternativo regressa às origens" [Alternative kit returns to origins]. Record (in Portuguese). 18 March 2008. Retrieved 22 December 2015. ^ "Benfica: Evolução histórica" [Benfica: Historic evolution]. zerozero (in Portuguese). Retrieved 2 September 2011. ^ Pereira 2009, p. 18. ^ Pereira 2009, p. 29. ^ Pereira 2009, p. 145. ^ Caffé, Amílcar (1 January 1997). "Vermelho / encarnado". Ciberdúvidas da Língua Portuguesa (in Portuguese). Retrieved 11 March 2018. ^ "List of UEFA Elite Stadiums 2011". Impressive Buildings. 6 August 2011. Archived from the original on 11 August 2011. Retrieved 5 July 2015. ^ "Characteristics and areas". S.L. Benfica. Retrieved 13 July 2017. ^ Lutz, Tom (20 March 2012). "Benfica's Stadium of Light to host 2014 Champions League final". The Guardian. Retrieved 30 August 2017. ^ "Stadiums in Portugal". World Stadiums. Retrieved 5 July 2015. ^ "Estadio da Luz". World Stadium Database. Retrieved 5 July 2015. ^ "Caixa Futebol Campus". StadiumDB. Retrieved 5 June 2016. ^ "Benfica (Best Academy of the year)". Globe Soccer. 28 December 2015. Retrieved 5 June 2016. ^ Belo, Miguel; Martins, Nuno (26 July 2013). "Museu dá o pontapé de saída" [Museum kicks off]. Record (in Portuguese). Retrieved 22 December 2015. ^ "Museu do Benfica é o melhor do ano" [Benfica Museum is the best of the year]. Rádio Renascença (in Portuguese). 12 December 2014. Retrieved 25 June 2015. ^ Weiss, Jessica (27 March 2012). "Showing Support in Song". The New York Times. Retrieved 5 July 2015. ^ a b "Classic club: Eagles ready to take flight". FIFA. Archived from the original on 30 June 2015. Retrieved 30 September 2015. ^ Pereira 2009, p. 58. ^ "Benfica Supporters' Clubs". S.L. Benfica. Retrieved 25 February 2015. ^ "Benfica aclamado por milhares no Marquês. Banho de multidão no Porto" [Benfica cheered by thousands at Marquess. Crowd bath in Porto]. ZAP (in Portuguese). 18 May 2015. Retrieved 26 March 2018. ^ "Benfiquistas já "reservaram" a rotunda do Marquês de Pombal" [Benfiquistas already "have reserved" the Marquês de Pombal roundabout]. Diário de Notícias (in Portuguese). 8 March 2016. Retrieved 26 March 2018. ^ a b "Concentration of people supporting the most popular club" (PDF). UEFA. 17 April 2014. p. 41. ^ a b c Gannon, Willie (3 May 2013). "Dortmund vs. Bayern Munich and Europe's 6 Premier Rivalries Right Now". Bleacher Report. Retrieved 3 January 2015. ^ Pereira 2009, pp. 220–221. ^ Palma, Irene (29 April 2005). "Benfica: 6 milhões de adeptos em Angola e Moçambique, 14 milhões no Mundo" [Benfica: 6 million supporters in Angola and Mozambique, 14 million worldwide]. Maisfutebol (in Portuguese). Retrieved 27 July 2016. ^ "Spectators". Liga Portugal. Retrieved 31 May 2017. ^ "Estádio da Luz em 9.º lugar no ranking das assistências na Europa" [Estádio da Luz ranks 9th in European attendance ranking]. A Bola (in Portuguese). 27 May 2017. Archived from the original on 31 May 2017. Retrieved 31 May 2017. ^ "Fez-se história!" [History was made!]. S.L. Benfica (in Portuguese). 13 May 2017. Archived from the original on 30 May 2017. Retrieved 30 May 2017. ^ a b "Sócios aprovam filiação de 25 anos e mandatos de quatro" [Members approve 25-year membership and four-year terms]. SAPO Desporto (in Portuguese). 30 April 2010. Retrieved 20 September 2017. ^ "Comunicado da Assembleia Geral sobre voto electrónico" [General Assembly announcement about electronic vote]. S.L. Benfica (in Portuguese). 25 October 2012. Archived from the original on 8 August 2014. Retrieved 19 September 2014. ^ "Most widely supported football club". Guinness World Records. 9 November 2006. Retrieved 11 October 2015. ^ "Benfica continua a ser o clube com mais sócios do mundo" [Benfica continues to be the world's club with most members]. SAPO Desporto (in Portuguese). 2 April 2015. Retrieved 3 April 2015. ^ "Os 30 times com mais sócios-torcedores no mundo" [The 30 teams with more supporter members in the world]. Exame (in Portuguese). 5 May 2015. Retrieved 24 June 2015. ^ "ObrigacoesBenficaSAD20152018" (PDF). S.L. Benfica (in Portuguese). 17 April 2014. p. 17. Archived from the original (PDF) on 29 September 2015. ^ "Benfica perdeu 100 mil sócios" [Benfica lost 100 thousand members]. SAPO Desporto (in Portuguese). 14 August 2015. Retrieved 14 August 2015. ^ "Prospeto" [Prospectus] (PDF). CMVM (in Portuguese). S.L. Benfica. 28 June 2018. p. 89. ^ Stokkermans, Karel (18 June 2015). "Coventric!". RSSSF. Retrieved 24 June 2015. ^ Nardelli, Alberto (2 June 2015). "Which European football clubs have never been relegated?". The Guardian. Retrieved 23 January 2016. ^ "So close, so far for Lisbon rivals". FIFA. Archived from the original on 31 October 2012. Retrieved 30 June 2015. ^ Nilsson, Jeff (14 December 2014). "S.L. Benfica vs F.C. Porto". TheSportster. Retrieved 5 September 2017. ^ Pereira 2009, p. 36. ^ "Benfica TV arrancou hoje com bloco noticioso" [Benfica TV started today with news block]. Expresso (in Portuguese). 10 December 2008. Retrieved 9 February 2016. 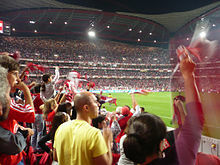 ^ "MEO transmite canal premium Benfica TV" [MEO broadcasts premium channel Benfica TV]. SAPO Desporto (in Portuguese). 28 June 2013. Retrieved 9 February 2016. ^ "Benfica TV compra jogos do Farense" [Benfica TV buys Farense's matches]. Correio da Manhã (in Portuguese). 13 July 2013. Retrieved 9 February 2016. ^ "Benfica-Ovarense transmitido em directo na Benfica TV e na Sport TV" [Benfica-Ovarense broadcast live on Benfica TV]. Expresso (in Portuguese). 12 December 2012. Retrieved 9 February 2016. ^ "Benfica TV seals Premier League rights in Portugal". Premier League. 28 February 2013. Archived from the original on 2 March 2013. Retrieved 3 June 2016. ^ "Oficial: Benfica TV garante transmissão das ligas italiana e francesa" [Official: Benfica TV guarantees broadcasting of Italian and French leagues]. Maisfutebol (in Portuguese). 4 July 2015. Retrieved 9 February 2016. ^ "Parabéns Jornal "O Benfica"!" [Happy birthday, newspaper "O Benfica"!]. S.L. Benfica (in Portuguese). 28 November 2015. Archived from the original on 18 October 2016. Retrieved 23 January 2016. ^ "Jornal O Benfica aumenta vendas" [Newspaper O Benfica boosts its sales]. Diário de Notícias (in Portuguese). 23 June 2005. Archived from the original on 22 March 2012. Retrieved 23 January 2016. ^ "Mística magazine". S.L. Benfica. Retrieved 28 August 2017. ^ Calhau, Pedro (6 December 2007). "Benfica apresenta "Mística", a nova revista do clube" [Benfica present "Mística", the club's new magazine]. Maisfutebol (in Portuguese). Retrieved 23 January 2016. ^ "Especial 'Tetra'" ['Tetra' special edition]. Mística (in Portuguese). No. 33. Portugal: Impresa Publishing. April – June 2017. p. 5. ISSN 3846-0823. ^ Pereira 2009, p. 138. ^ "Statutes (PLC)". S.L. Benfica. Archived from the original on 28 June 2015. Retrieved 26 June 2015. ^ "Venda de terrenos do Benfica explica saneamento e opção-SAD" [Sale of Benfica's lands explains budgetary improvements and SAD option]. Record (in Portuguese). 11 February 2000. Retrieved 22 December 2015. ^ "Benfica SAD (PLC)". S.L. Benfica. Archived from the original on 26 June 2015. Retrieved 26 June 2015. ^ "Prospecto de admissão à negociação ao Euronext" [Information to Euronext for admission of shares] (PDF). CMVM (in Portuguese). S.L. Benfica. 6 June 2012. p. 75. ^ Luís, José Pedro (21 May 2007). "Benfica entra na bolsa em fase de recuperação financeira" [Benfica enter the stock market while in financial recovery]. Jornal de Negócios (in Portuguese). Retrieved 11 October 2015. ^ Pereira 2009, p. 136. ^ Duarte, Pedro (15 June 2007). "Joe Berardo lança OPA para controlar Benfica" [Joe Berardo launches takeover bid to control Benfica]. Diário Económico (in Portuguese). Archived from the original on 2 June 2013. Retrieved 2 July 2015. ^ Duarte, Pedro (15 June 2013). "OPA incide sobre 60% do capital da SAD do Benfica" [Takeover bid focuses on 60% of Benfica SAD's capital]. Diário Económico (in Portuguese). Archived from the original on 25 December 2013. Retrieved 2 July 2015. ^ "Prospecto de admissão à negociação ao Euronext" [Information to Euronext for admission of shares] (PDF). CMVM (in Portuguese). S.L. Benfica. 6 June 2012. p. 36. ^ "Comunicado" [Announcement] (PDF). CMVM (in Portuguese). S.L. Benfica. 8 September 2014. ^ "Águias resgatam jogadores ao Benfica Stars Fund por 29 milhões" [Eagles rescue players from Benfica Stars Fund for €29 million]. Record (in Portuguese). 8 September 2014. Retrieved 22 December 2015. ^ Sambidge, Andy (19 May 2015). "Emirates adds Benfica to sports sponsorship portfolio". Arabian Business. Retrieved 19 May 2015. ^ Pereira, Paulo Jorge (20 May 2015). "Acordo Benfica-Emirates vale até 30 milhões de euros" [Benfica-Emirates deal is worth up to 30 million euros]. Diário Económico (in Portuguese). Archived from the original on 2 July 2015. Retrieved 20 May 2015. ^ Curado, Paulo (2 December 2015). "400 milhões de euros por 170 jogos do Benfica na Luz" [400 million euros for 170 Benfica home matches]. Público (in Portuguese). Retrieved 14 September 2017. ^ Santos Guerreiro, Pedro (2 December 2015). "O maior negócio do futebol português: Benfica na NOS por €400 milhões" [The biggest deal in Portuguese football: Benfica on NOS for €400 million]. Expresso (in Portuguese). Retrieved 14 September 2017. ^ Miranda, Tiago (8 December 2015). "'Dinheiro da NOS é para baixar o passivo'" ['Money from NOS is to lower the debt']. Expresso (in Portuguese). Retrieved 18 September 2017. ^ "Brand Finance Football 50 2016 - Full Results (EURm)" (PDF). Brand Finance. p. 15. ^ Prada, Jon (2 June 2017). "La mina de oro del Benfica" [Benfica's gold mine]. Marca (in Spanish). Retrieved 12 September 2017. ^ "Benfica SAD apresenta 20,6 milhões de euros de lucro" [Benfica SAD present profit of €20.6 million]. Público (in Portuguese). 19 September 2018. Retrieved 22 September 2018. ^ "SAD com passivo abaixo dos €400 milhões pela primeira vez em oito anos" [SAD with liabilities below €400 million for the first time in eight years]. A Bola (in Portuguese). 20 September 2018. Archived from the original on 20 September 2012. Retrieved 22 September 2018. ^ "Deloitte Football Money League 2019" (PDF). Deloitte. January 2019. pp. 6–7. ^ "First team squad information". S.L. Benfica. Retrieved 11 July 2018. ^ "A numeração das camisolas para 2018/19" [Numbering for 2018–19]. S.L. Benfica (in Portuguese). 10 July 2018. Retrieved 11 July 2018. ^ "Miklos Feher: Football remembers". FIFA. 25 January 2014. Retrieved 4 June 2014. ^ "Equipa Técnica" [Technical staff]. S.L. Benfica (in Portuguese). Retrieved 10 February 2019. ^ "Governing bodies". S.L. Benfica. Retrieved 12 July 2017. ^ Rebelo, Marco (12 August 2016). "No reino dos maiores" [In the realm of the greatest]. O Benfica (in Portuguese) (3772). S.L. Benfica. p. 8. ISSN 1073-0311. ^ Rainbow, Jamie (6 January 2014). "Portugal legend Eusébio remembered". World Soccer. Retrieved 12 June 2016. 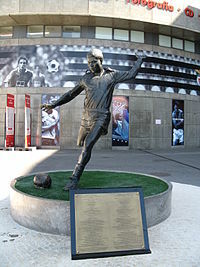 ^ "The great Eusébio". New African. 28 January 2014. Retrieved 12 June 2016. ^ Bragança, José (28 April 2015). "Luisão, um capitão para a história" [Luisão, a captain for the ages]. zerozero (in Portuguese). Retrieved 28 April 2015. ^ Silveira, João Pedro (30 June 2015). "Cosme Damião: o fundador" [Cosme Damião: the founder]. zerozero (in Portuguese). Retrieved 18 June 2016. ^ "O "bi" inédito, o "top" português e as outras marcas de JJ" [The unprecedented "bi", the Portuguese top and other JJ's records]. Maisfutebol (in Portuguese). 18 May 2015. Retrieved 7 January 2016. ^ "Jesus soma 10 títulos e chega a número 1 dos treinadores do Benfica" [Jesus collects 10 titles and is Benfica's most decorated coach]. Jornal de Notícias (in Portuguese). 29 June 2015. Retrieved 26 January 2016. ^ Brites Dias, Andreia; Sousa, Vasco (15 May 2016). "Rui Vitória: o treinador encarnado com maior percentagem de vitórias" [Rui Vitória: the Benfica coach with the highest winning percentage]. zerozero (in Portuguese). Retrieved 17 May 2016. ^ Pereira 2009, p. 110. ^ Stokkermans, Karel (23 December 2013). "Unbeaten during a League Season". RSSSF. Retrieved 1 January 2014. ^ "Benfica wrap up Portuguese league title with victory over Nacional". ESPN FC. 15 May 2016. Retrieved 17 May 2016. ^ "Europe's longest domestic winning streaks". UEFA. 14 January 2017. Retrieved 20 January 2017. ^ Pereira 2009, p. 106. ^ Martins, Paulo (27 July 2004). "SL Benfica's series of 56 matches unbeaten in the I Divisão". RSSSF. Retrieved 1 January 2014. ^ "Europe's longest unbeaten runs in all competitions". UEFA. 15 January 2017. Retrieved 20 January 2017. ^ Stokkermans, Karel (30 April 2015). "Champions' Cup/Champions League Trivia". RSSSF. Retrieved 17 June 2016. ^ "Benfica é rei sem coroa da competição" [Benfica is the competition's crownless king]. Record (in Portuguese). 14 May 2014. Retrieved 22 December 2015. ^ "2008–09 Primeira Liga stats". TheFinalBall. Retrieved 9 February 2016. ^ "2008–09 Player totals". TheFinalBall. Retrieved 9 February 2016. ^ "2008–09 Competition totals". TheFinalBall. Retrieved 9 February 2016. ^ "2009–10 Season". Liga Portugal. Retrieved 9 February 2016. ^ "2009–10 Player totals". TheFinalBall. Retrieved 9 February 2016. ^ "2009–10 Competition totals". TheFinalBall. Retrieved 9 February 2016. ^ Kassies, Bert. "UEFA Team Ranking 2010". Retrieved 28 May 2017. ^ "2010–11 Season". Liga Portugal. Retrieved 28 May 2017. ^ "2010–11 Player totals". TheFinalBall. Retrieved 9 February 2016. ^ "2010–11 Competition totals". TheFinalBall. Retrieved 9 February 2016. ^ Kassies, Bert. "UEFA Team Ranking 2011". Retrieved 28 May 2017. ^ "2011–12 Season". Liga Portugal. Retrieved 9 February 2016. ^ "2011–12 Player totals". TheFinalBall. Retrieved 9 February 2016. ^ "2011–12 Competition totals". TheFinalBall. Retrieved 9 February 2016. ^ Kassies, Bert. "UEFA Team Ranking 2012". Retrieved 28 May 2017. ^ "2012–13 Season". Liga Portugal. Retrieved 28 May 2017. ^ "2012–13 Player totals". TheFinalBall. Retrieved 9 February 2016. ^ "2012–13 Competition totals". TheFinalBall. Retrieved 9 February 2016. ^ Kassies, Bert. "UEFA Team Ranking 2013". Retrieved 28 May 2017. ^ "2013–14 Season". Liga Portugal. Retrieved 28 May 2017. ^ "2013–14 Player totals". TheFinalBall. Retrieved 9 February 2016. ^ "2013–14 Competition totals". TheFinalBall. Retrieved 9 February 2016. ^ Kassies, Bert. "UEFA Team Ranking 2014". Retrieved 28 May 2017. ^ "2014–15 Season". Liga Portugal. Retrieved 28 May 2017. ^ "2014–15 Player totals". TheFinalBall. Retrieved 9 February 2016. ^ "2014–15 Competition totals". TheFinalBall. Retrieved 9 February 2016. ^ "2015–16 Season". Liga Portugal. Retrieved 23 May 2016. ^ "2015–16 Player totals". TheFinalBall. Retrieved 23 May 2016. ^ "2015–16 Competition totals". TheFinalBall. Retrieved 23 May 2016. ^ Kassies, Bert. "UEFA Team Ranking 2016". Retrieved 28 May 2017. ^ "2016–17 Season". Liga Portugal. Retrieved 28 May 2017. ^ "2016–17 Player totals". TheFinalBall. Retrieved 28 May 2017. ^ "2016–17 Competition totals". TheFinalBall. Retrieved 28 May 2017. ^ Kassies, Bert (24 May 2017). "UEFA Team Ranking 2017". Retrieved 28 May 2017. ^ "2017–18 Season". Liga Portugal. Retrieved 13 May 2018. ^ "2017–18 Player totals". TheFinalBall. Retrieved 13 May 2018. ^ "2017–18 Competition totals". TheFinalBall. Retrieved 13 May 2018. ^ Kassies, Bert (13 May 2018). "UEFA Team Ranking 2018". Retrieved 13 May 2018. ^ Stokkermans, Karel (14 January 2016). "Trivia on Winning Domestic Championships". RSSSF. Retrieved 17 January 2016. ^ a b "Taça de Portugal Placard - Vencedores" [Taça de Portugal Placard - Winners]. FPF (in Portuguese). Retrieved 5 March 2017. ^ Castro, Gaspar; Agre, João (20 May 2016). "Benfica continua a ser o rei da Taça da Liga" [Benfica remain kings of Taça da Liga]. SAPO Desporto (in Portuguese). Retrieved 23 May 2016. ^ Agre, João (5 August 2017). "Benfica começa a nova época de futebol com a conquista da Supertaça" [Benfica start new football season with Super Cup triumph]. SAPO Desporto (in Portuguese). Retrieved 7 January 2019. ^ "Águias alcançam o 79.º título do seu historial" [Eagles achieve the 79th title in their history]. Record (in Portuguese). 7 August 2016. Retrieved 2 September 2016. ^ "Benfica conquista a sua 6ª Supertaça e chega aos 79 títulos" [Benfica conquer their sixth Super Cup and reach 79 titles]. SAPO Desporto (in Portuguese). 7 August 2016. Retrieved 2 September 2016. ^ "Benfica rediscover past glories". FIFA. 3 February 2006. Archived from the original on 25 May 2011. Retrieved 23 May 2016. ^ "Benfica lift cup to seal historic treble". UEFA. 18 May 2014. Retrieved 3 July 2015. ^ "Benfica conquista Taça e consegue o triplete em Portugal" [Benfica conquer Portuguese Cup and achieve the treble in Portugal]. FIFA (in Portuguese). 18 May 2014. Archived from the original on 19 May 2014. Retrieved 18 May 2014. ^ a b c "Decorations". S.L. Benfica. Retrieved 10 May 2014. Oliveira, Mário Fernando de; Silva, Carlos Rebelo da (1954). História do Sport Lisboa e Benfica (1904–1954) [History of Sport Lisboa e Benfica (1904–1954)] (in Portuguese). Lisbon, Portugal. Perdigão, Carlos (2004). Sport Lisboa e Benfica: 100 gloriosos anos [Sport Lisboa e Benfica: 100 glorious years] (in Portuguese). Matosinhos, Portugal: QuidNovi. ISBN 989-554-099-X. Pereira, Luís Miguel (November 2009). Bíblia do Benfica [Benfica Bible] (in Portuguese) (7th ed.). Carcavelos, Portugal: Prime Books. ISBN 978-989-655-005-9. Tovar, Rui Miguel (2014). Almanaque do Benfica (1904–2014) [Benfica Almanac (1904–2014)] (in Portuguese) (2nd ed.). Alfragide, Portugal: Lua de Papel. ISBN 978-989-23-2764-8.